Backpacks have a come a long way. From a purely functional accessory that made it easier to carry things around, to a high fashion accessory that has created style icons, to even creating an aerodynamic curve as you zip through the street with your motorcycle backpack. For those of us who love our backpacks, the good news is that they are constantly changing and evolving with the times – sporting new shapes, new textures, and new materials. Where you once had canvas and leather as raw materials, you now have a more hi-tech material that can withstand rain and rough treatment, fashioned from tough synthetic fibers. Through all of this, good backpacks have never lost one important feature – comfort. No matter how they change, comfort will almost always remain an essential feature. Whether they are used to carry school books, your training gear to the gym, or your fragile laptop, as you ride at nearly 100 mph. There is something indescribable when you accelerate off ahead of everyone and everything else. Riding a bike has always held a primal fascination for many of us – something about it feels free and independent, perhaps even rebellious. You could even say that bikers are modern-day cowboys, riding on metal-and-fuel stallions. There is an aura around a motorcycle that simply does not exist with other modes of transport. With vehicle traffic hitting record highs in most cities around the globe, a bike is perhaps a clever and convenient way of navigating through congestion and getting from point A to point B on time. Through all of this, a good motorcycle backpack will stay stuck to you like Superman’s cape. This brings us to today’s topic – the best motorcycle backpack. Our review team has put together a list of some of the best motorcycle backpacks available. We’ve taken the magnifying glass to ten of them, picking each of their features apart – talking about what works and what may not. At the end of it all, our mission here is to provide you with all the necessary information so that you can then make up your mind and select a riding companion that will go wherever you go – from city streets to mountain tops. Imagine you are riding back after a hard day’s work, it’s late evening and there is the usual traffic down the stretch of highway. Years and years of riding have put you in an almost autopilot-mode as you ride down the stretch with your focus on just getting home. That is when you hear a screech, the front wheel locks up, and before you know it – you are thrown off your seat and take a tumble down the asphalt. And all this with the OGIO Mach 5 Motorcycle Backpack right behind you. The bike screams down the tarmac, bright sparks flying. You get up, gingerly, with the only thought running through your mind – ‘is my Macbook safe?’ You unzip the backpack slowly and peek inside, the sight of your belongings safely intact brings unbridled joy. This really happened to one of the users of the OGIO Mach 5 Motorcycle Backpack. The bike was nearly totaled after the crash and the rider escaped with a bit of bruising. The backpack itself had torn a small hole, but it fully protected the laptop inside. This is just one reason why the Mach 5 comes highly recommended by many bikers. The Mach 5, is another stellar addition to the Mach lineage of motorcycle riding backpacks. The hard shell motorcycle backpack does not only cocoon the stuff inside, but it also protects your back if you were to fall off your bike. All thanks to the next-generation material that makes the Mach 5. Better yet, the backpack also provides a near 100% protection from the rain, keeping the damaging moisture away from your valuable items. This is certainly an upgrade on the previous versions, which did allow a bit of moisture to seep inside. An additional feature that most riders would surely appreciate is a small pouch that is attached to a side of the backpack, which can be used to carry small but important items such as keys or cell phone. The pouch has been attached in such a way that it forms a part of the Mach 5 rather than an extra accessory. Apart from the stellar protection that the motorcycle backpack offers, the Mach 5 from OGIO makes quite the mean style statement as well. Covered in ‘stealth’ mode (just another way of saying that the color option is black), the backpack sports a chiseled body that will complement the rider and bike. It will be quite a sight as you ride through traffic with this accessory attached to your back. This brings us to the next feature – the straps. The straps are often an undervalued and ignored aspect of bag design. Most forget that they perform perhaps the most important function of clinging close to the body, thereby allowing the bag-portion to carry all the contents securely. The Mach 5 features straps that are comfortable and strong. Plus they do a really good job of sticking close to you. Apart from the shoulder straps, there are additional chest straps that you buckle on before you ride. If the outer body is lean and ripped, the inside of the hard-shell motorcycle backpack will surprise you. The Mach 5 has enough space to hold the entire range of Apple products – the Mac, the iPad, the iPhone, and even an iPod for good measure – and still have enough room to hold a pair of running shoes and workout clothes. In other words, everything you need for your work and your workout can all fit snugly inside the OGIO motorcycle backpack. Streamlined, streamlined, streamlined…three words that best describe the Mach 3 motorcycle backpack. When it comes to an accessory that is a perfect fit for your mean machine, few can come close to OGIO’s offering. Crafted from what looks like a single module, the backpack is literally designed to be an extension of you as you accelerate away. This is, perhaps, what makes the Mach 3 an enduring accessory to all the bikers out there. A lot of thought has gone behind the styling, which shows with the aerodynamic performance of the OGIO motorcycle backpack. The attention to the design aspect also makes this motorcycle riding backpack a minimalist piece, which in turn offers a compact, protective cocoon for whatever you wish to carry. There are smartly designed compartments inside that can hold almost everything you would need during the day: Right from all the computer paraphernalia such as laptops, tablets, and phones, to other items such as books and notepads. You can even carry your sneakers with two specially designed pouches that will hold the shoes in place. The one thing that you will observe with the Mach 3 motorcycle backpack is that even when it is full, the bag still manages to stay lightweight on your back. You can thank its ergonomics that evenly distributes the weight across your back, without placing too much weight or pressure on your shoulders or on your spine. The way the riding accessory achieves this is with a clever shoulder gasket that allows the Mach 3 to stick close to you. Then there are the soft neck straps that are a hidden multitasker: First, they work with the shoulder straps for an even weight distribution, keeping stress off the neck muscles. The straps also allow the helmet to sit snug, sliding underneath it, without causing any irritation or discomfort. 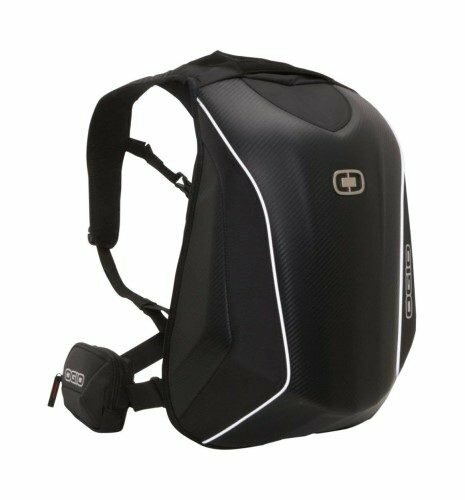 Another aspect of the motorcycle laptop backpack that has certainly increased its popularity is the accessory’s waterproof nature. 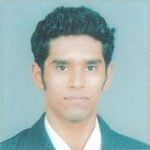 Just have a look at all the user reviews and testimonials. When you’re on your bike and the heavens open up, the last thing you need to worry about is moisture seeping into your backpack. The Mach 3, with its intelligent zip lining, will keep the raindrops away from your precious valuables. Ogio’s offering is rich with features – it is also high on comfort. The backpack has a bolstered foam that allows the weight to sit comfortably on your back without causing any kind of skin irritation. The foam also allows for ample ventilation. The increased airflow will keep your skin fresh and prevent excessive sweat build up. The Mach 3 has many things going for it, but it can also feel a bit unpractical when compared to a regular backpack. The bag cannot be placed in an upright position and does not have extra pockets to carry water bottles. Despite a few shortcomings, the OGIO motorcycle backpack is worth investing in. The CUCYMA backpack follows close on the heels of Mach 5 in terms of design and style. But limiting the backpack to just an imitation piece would be criminal. 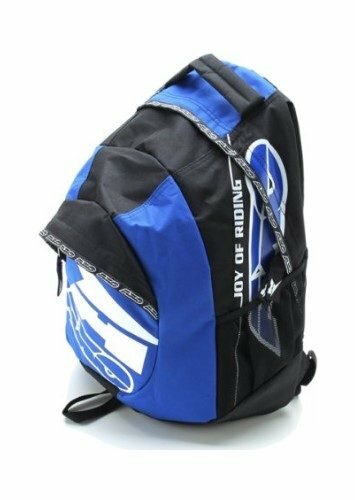 In fact, many riders have found it to be one of the best backpacks for motorcycle riding because of its durability and economical price range. The latest offering from CUCYMA is crafted from some of the toughest, most resilient materials that you can find on a backpack. First up is the carbon fiber (yes, you read that right) PVC body that enables the bag to keep its shape even when it is empty. The other advantage is that the hard-shell body offers a further layer of protection for riders, especially if they have the misfortune of crashing at a high speed. One user review states just that: the buyer’s son was thrown off his motorcycle, but the hard shell backpack protected him, especially his neck, spine, and back. Another design aspect that is sure to appeal to you is the rugged, water-resistant nylon construction. Now, this may not make the motorcycle riding backpack 100% waterproof, but it does a very good job of whisking away rain, and keeping the water away from any precious items your bag may hold. The intelligent zip liner also plays its part in creating a near vacuum for the contents inside, keeping them safe. On the outside, the motorcycle backpack is aerodynamic in style, without drag and offering minimum wind resistance. On the inside, the CUCYMA has a 30-liter cargo capacity. The intelligent design of the backpack’s body is evenly matched on the inside as well. A large, cushioned pouch that can be fastened with velcro will securely hold your laptop. Another smaller pouch, stationed just below the large one, will hold your tablet. Then there are the mesh pockets, stationed near the two pouches, that can hold all your smaller items such as a wallet, cell phone, and keys. The backpack is also supported by some hi-tech strapwork around the shoulders and the sternum. The straps are lush and comfortable enough to hang on your shoulders an entire day without causing any discomfort. They are also fashioned in such a way that they will never slip off – even if you were to fall off your bike. The straps also perform an intelligent, ergonomic function of managing the load that you carry, spreading it across the larger area of your back, rather than your shoulder or neck. 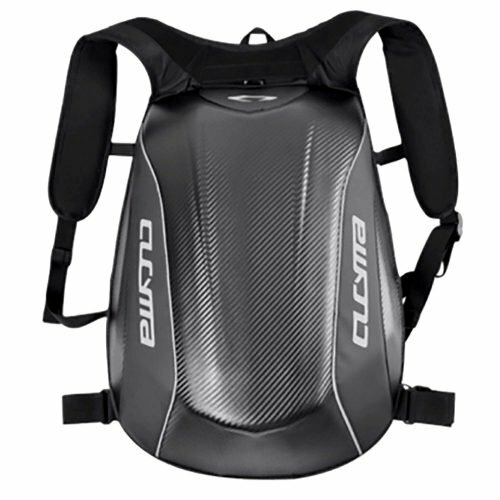 The CUCYMA is one of the best motorcycle backpacks that you can get your hands on, and for the price that it retails at, this biking accessory is surely a steal. The one aspect that we almost adore is the amount of work put in to make the backpack scratch-resistant as well as corrosive-resistant. You can rest assured that the bag will last a long time and will be a constant companion on many a ride. The name itself may conjure up images of bold, adventurous voyagers who set forth to discover new lands over turbulent seas, without any fear in their hearts. The Viking backpack is, in a way, an attempt to tap into our primal wanderer spirit – and it does not disappoint. The best part of the Viking Moto is that it is one of the best all-rounders in the segment. A common complaint among users with a motorcycle backpack is that, for all of its aerodynamic styling and sleek looks, the bag may not be the most practical accessory to carry around. This is where the Viking Moto is slightly ahead of its peers. Fashioned from the very resilient Cordura, the heavy-duty material provides a tough outer shell that has proven to be scratch and corrosion resistant. The other advantage is that the material provides just the right amount of flexibility to go with its toughness, which then allows the backpack to act as a more regular rucksack. Keep it on the floor without any fear of it falling over, stuff it with regular everyday items such as a laptop, tablet, phone, wallet, keys; and lug it just about anywhere you go. One Viking user, a photographer, rated the backpack high because of its ability to carry her camera, lenses, and other photography paraphernalia. The versatility of the Viking Moto makes it an ideal women’s motorcycle backpack too. Like many of its peers, there is no compromise made on the aerodynamic front. Whether you are zipping past traffic or just cruising along, the Viking Moto will stay close on your back. Being a motorcycle backpack, the Moto also features a helmet clasp. The clasp is located on the body itself allowing you to hook the helmet to your bag and carry it wherever you go. The Viking is also an all-out waterproof motorcycle backpack, another feature that many of its peers cannot claim with complete authenticity. The Moto comes with a rain cover that wraps over the bag, allowing you to protect whatever sensitive valuables the bag may hold from moisture and rain. What certainly impressed us about the Viking backpack is the attention paid to the little details. For instance, the zippers are nice and large, allowing you to open and close the bag with a minimum of effort. There is also reflective piping that increases the visibility during night-time. The Viking Moto ticks almost all the boxes for a bike backpack as well as a regular one. The only drawback, if you can call it that, is that the body is not a hard shell. If you were to take a tumble from the bike, the backpack will not offer as much protection compared to a hard-shelled backpack. When we say motorcycle backpack, the first image that come to mind is of a sleek, minimalist, almost futuristic, bag – aerodynamic and offering no wind resistance at all. You can almost visualize the accessory as an extension of the rider as they cruise ahead on the road. Then you have the Seibertron Motorbike Backpack that is just about the opposite, in every which way. We are the first to admit that this motorcycle riding backpack took us a bit by surprise – and we are glad that it did. The Seibertron bike accessory offers a different set of features for a different kind of rider. The speed devils on the fast machines may very well select another bag on the list but the Motorbike Backpack is a beast of a very different nature. Gone is the need or requirement for aerodynamic and no-drag design. The Backpack is big and broad, almost posing a challenge to fill it up with all that you can think of. And even then, there may be some more space left. The Seibertron is square too, forgoing the need to fit any particular slim mold. What all of this translates into is into two main compartments, the second of which can easily carry a weekend’s worth of clothes and food. The first compartment can be used to carry laptops and tablets. Then are two front pouches, a small and a medium. The small pouch should come in handy when you wish to store small items such as keys and wallets. The medium pouch can transport water bottles and snack packets. One of the first questions that may arise in your mind when you look at the Backpack is whether or not it is waterproof. The good news is that the material, which may seem like canvas, is actually 90% waterproof. What this means is that the bag will whisk away most of moisture and rain, but the zipper may leak slightly. Having said that, the Seibertron can be easily used in light and moderate rainfall without any fear of damage to the contents inside. 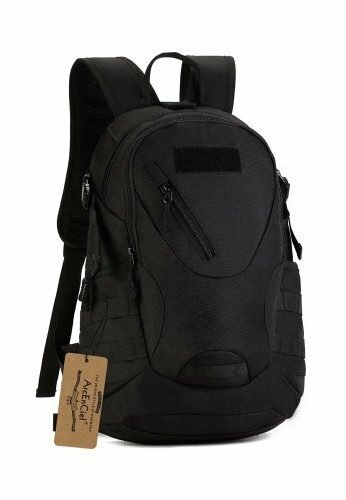 To touch upon just a bit more on the backpack’s visual style, the bag creates a rough and tough image with its charcoal black color-coding and military-style aesthetic. An American flag stitched on the small pouch adds a touch of patriotism as well. For such a big bag that can carry quite the load, the shoulder straps play a mighty important role. Not only do the straps need to be strong enough to hold the load, but they also need to be comfortable enough not to cause any discomfort or irritation. The designers of the backpack have provided enough padding for the straps to rest comfortably on your shoulders while riding. They can also be adjusted for a better fit across your back. The vertical straps provide an intelligent function by being bolstered with two horizontal straps that cross the abdomen. One is a thin attachment, meant to brace any excess weight against your body. The second is a broader, thicker attachment that will take some weight off your back and shoulders – should the load be a bit heavy. What we are trying to get at is that for its large size, the motorcycle backpack is well equipped to handle any load, without putting any additional strain on you. The Seibertron may divide opinion among riders. The cruisers and choppers will definitely give it a thumb’s up, while the moto-racers may feel it is too big for a bike bag. Both opinions are valid. The Backpack is better suited for the bigger bikes than for the leaner racer bikes. It seems to us that the big bag has been designed to handle almost any kind of situation that may arise when you are on the road. There are extra buckles provided on the side as well on the top. A helmet could be easily attached to the top, while the two side buckles can be used to hold a water bottle. The Seibertron is a different, perhaps even unusual, motorcycle backpack. However, it’s a great long-distance companion and is sure to meet the needs of many. The big daddy of motorcycle backpacks is back. What we absolutely love about Seibertron is that they are not afraid to showcase who they truly are – a manufacturer of big backpacks that you can take riding. They are not competing with their peers who make sleek, aerodynamic backpacks that are akin to visual eye candy. Seibertron, instead, is focusing on their strength without worrying about what everyone else is doing. This has only enabled them to stand apart from the clutter and provide a distinct product that offer s a different set of features for a different kind of rider. The Motorcycle Helmet Backpack is another product from the Seibertron range that comes with a unique set of features. The backpack has been crafted from the same, tough material used in the previous Seibertron. This allows you to put the bag through a variety of stern tests and the bag will come out unscathed and unscratched. The other benefit of the material is that it repels water, protecting any valuables that you may be carrying inside the bag. The only chance of moisture or rain to seep in is through the zipper. One thing that we can say with an air of certainty is that the motorcycle backpack is built to carry things around, which makes it an ideal companion if you maintain an interest in biking long distances. There are two compartments that can house just about everything: Right from computing devices (including a 17-inch laptop), to camping and hiking gear. The second compartment is ideal for carrying clothing and even food. With the Molle-inspired design, the backpack allows you to carry maximum load, with a minimum amount of strain. The Seibertron backpack has quite a number of features that make it one of the best motorcycle backpacks but the standout feature, the one that allows the accessory to stand apart from the rest, is the unique helmet holder bag attached to the front. From a design perspective, it is quite a simple achievement. An extendable, half-open pouch that can easily fit a full-face helmet inside. The pouch can be clasped and unclasped with a buckle that can be adjusted to your requirements. The simplicity of the helmet holder can easily distract from its almost genius functionality. Besides a helmet, the adjustable buckles allow you to carry other objects such as a football, basketball, maybe even a large water pouch. Just like the backpack itself, the helmet holder has the flexibility and the requisite strength to perform a variety of functions. The uniqueness of the Seibertron Motorcycle Helmet Backpack, combined with its load-carrying capacity, makes it a perfect accessory for long rides that usually lead to hiking or camping. The best part is that you do not even have to wear it while you ride your Harley or chopper. You can simply strap the bag on to your bike with a strong leash and you’re good to go. The construction of the backpack allows it to be an ideal pillion rider and, even if there is a bit of excess weight, it will stay secure under the leash. The latest from the Seibertron range is high on functionality, without compromising on the style aesthetic. The subtle, dark color-coding – along with the military/tactical-aesthetic – makes it an attention grabber. Whether you take along during your office commute or to a faraway hilltop, you won’t be disappointed. 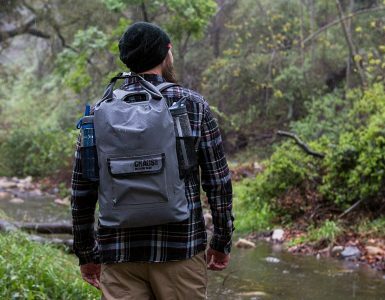 At first glance, the Mardingtop backpack may seem like a regular backpack that you can use for a variety of everyday purposes, as well as hiking and camping. The accessory is of a regular size, built strong, and comes in a variety of color options. Take a closer look, however, and you will see a great motorcycle riding backpack too. The manufacturers have, with a certain amount of intelligence, shaped the bag to make it a true all-rounder. You can carry it around to your office or college and it won’t feel out of place. The backpack has a subtle aerodynamic shape that allows it to stream through the wind without causing too much flutter. The capsule-shape of this Mardingtop backpack features three main compartments. The first compartment is tall and slim, allowing you to slide daily essentials like your keys and wallet into. You could also even store some stationary into it. The second compartment can hold bigger items such as a lunchbox, books, and tablet. You could probably even sneak in your gym gear too. The third compartment is where all the heavy-duty work gets done. You can carry a large laptop, as well as enough clothing and supplies to last you a weekend. Moving on from the compartments, the motorcycle backpack has a bit of a wanderer appeal at its core. 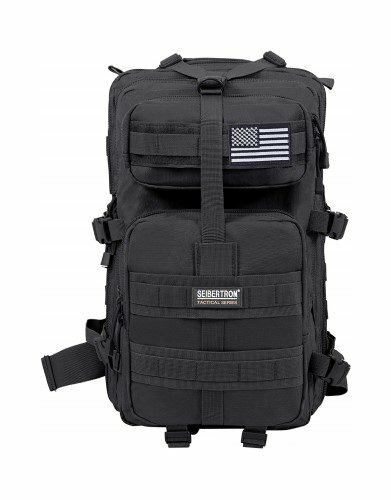 The body has been based on the tactical Molle design which allows a series of extra webbing where you can hook additional items like a torch, battery pack, or even a first aid kit for easy access. You could even hook your water bottle on here. These little details can make a big difference when you spending a fair amount of time in the outdoors. Touching a bit more on the backpack’s capsule-shape, it enables the bag to have two additional pouches on the side, without letting them affect the aerodynamics of the design. The pouches are zipped as well, enabling you to store even more items such as your phone, music player and/or earphones. 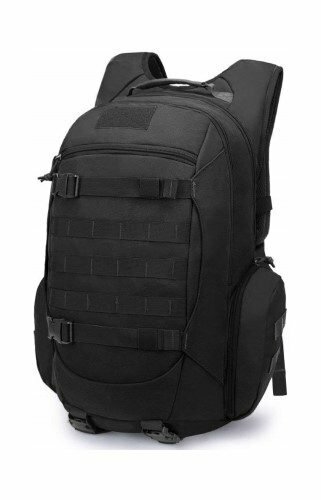 If you had any doubt regarding the tactical intelligence of the Mardingtop backpack, the next feature, which is also one of our favorites, will dispel all doubt. 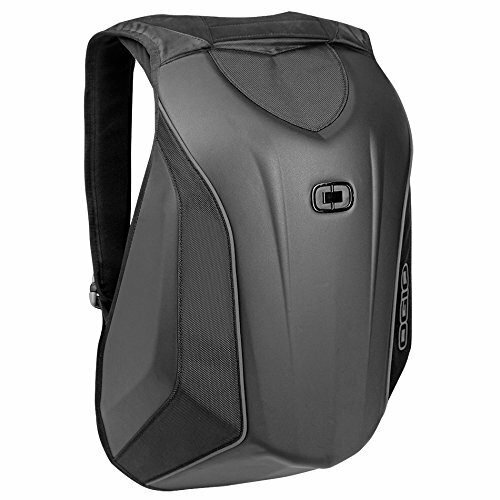 The laptop compartment within the third compartment of the backpack can easily double up as your hydration panel. The buckled pouch can carry a 2.5l water bag and, even better, contains dual exit ports for a tube to come through from the water bag right into your mouth. This can come in handy, especially when you are out cruising for hours and have the option of keeping yourself hydrated on the go rather than having to stop and pause for a water break. Although perhaps not marketed as a motorcycle backpack. the Mardingtop is definitely a great option. The two front straps that run across the backpack’s body allow you to compress the bag, increasing the aerodynamics of the bag. The same straps, when unbuckled, allow the bag to expand and carry ever more weight if required. The ergonomics of the backpack make it a comfortable riding bag too. The sternum strap ensures that the backpack sticks as close to your body as possible, while the padding on the back allows the bag to sit comfortably on your shoulders, without causing any strain to the neck or spine. 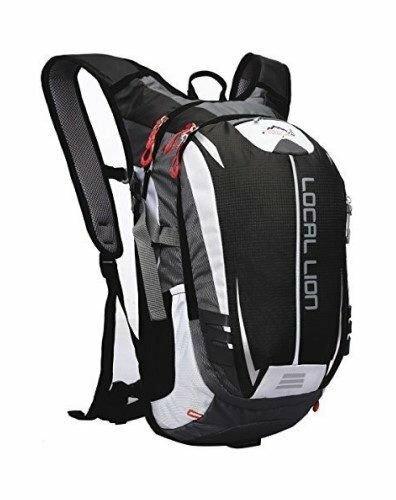 Here we have another entry in the motorcycle backpack category that fits the bill of an all-rounder to a t. The Locallion is often marketed as a bicycle backpack, however, it is also suitable to be used when riding a motorcycle. The fact that the minimalist rucksack has actually been designed to be on the go, only makes the transition from bicycle to bike, and vice versa, that much easier. To start off, we love the backpack’s slim aesthetic which makes the rucksack feel more like an extension of your own body rather an added attachment. Even with the minimalist design, the backpack features two compartments. A medium-sized compartment that can fit a variety of items such as a compact umbrella, notebook, and tablet. Then there is a second, larger-sized compartment that can carry a slim laptop along with a few more accessories. In case you are riding around, the laptop compartment also doubles up as a water pouch carrier with exit ports that allow the tube to flow from the pouch directly to your mouth. Apart from the two main compartments, you will find smartly-placed side pockets and pouches that can carry quick-access things like your wallet, phone, earphones, and chargers. If you’re not a fan of using water pouches, there is also a side pouch to carry a water bottle if you prefer. 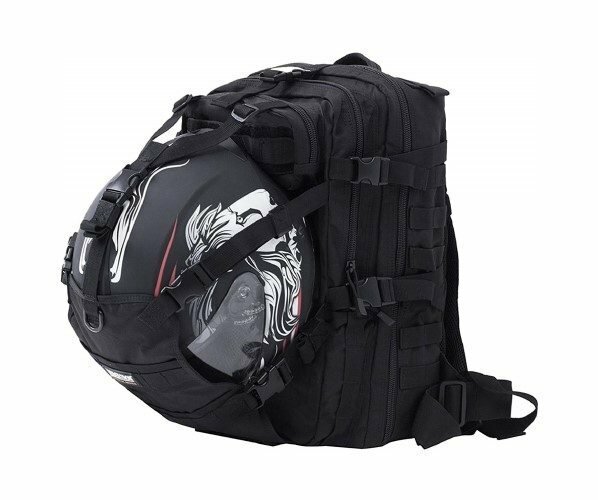 The standout feature, in terms of design, is the helmet hood that transforms this slim rucksack into a motorcycle backpack with helmet holder. A small zippered pouch located at the bottom of the bag holds the hood which you can wrap over the helmet and clip on to the top of the backpack. This feature removes any hassle of carrying protective headgear. You don’t have to hold it in another hand or dangle it from the side of the bag, exposing it to bumps and scratches. The headgear is securely fastened to the backpack and protected. You could also use the helmet hood to transport other difficult-to-carry items such as a football or basketball. Bottom line: The hood is as multipurpose as the backpack. The Locallion has completely focused on creating a slim, minimalist bag that will go wherever you go. The rucksack boasts some intelligent features that make it one of the best backpack for motorcycle riding. Take for instance the breathable mesh located at the back of the bag. The material and padding have been specially designed to provide the right amount of ergonomic support, as well as provide a lightweight breathable experience that offers maximum comfort to the rider. Another important aspect of the mesh support is that it reduces hot spots which can result due to continuous contact with your skin. 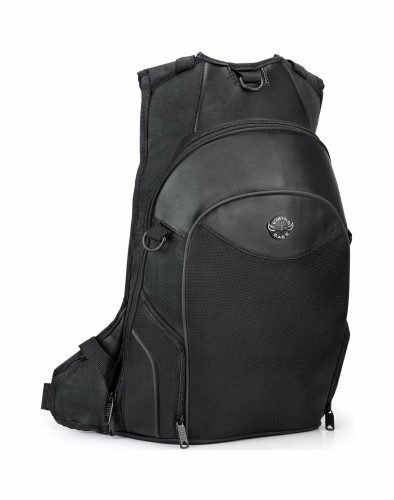 By allowing a steady stream of air flow between the body and the backpack, the Locallion prevents heat build-up and, in the process, also reduces sweat build-up. The shoulder straps of the motorcycle backpack exhibit a superior level of design intelligence too. The Locallion is indeed lightweight and the straps make it even lighter by distributing the load evenly across your back. Even if you are carrying the full capacity of 18 liters, the backpack will still be comfortable. You also have additional belts which brace against your sternum and abdomen to help you stay in the right, ergonomic position while riding your motorcycle. What makes the backpack a top contender is that it gets the little details just right -the reflective strips are a fine example of that. 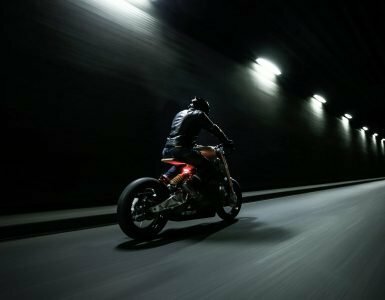 In case you are riding along a dark highway, the reflective motorcycle backpack provides a clear and early warning to any vehicle following behind. The ArcEnCiel Tactical Backpack’s design and styling closely follow a tactical aesthetic (which is of no surprise considering its title). What will suprise you, however, is that for all its tactical styling – the ArcEnCiel also displays some nifty aerodynamic styling. Similar to hard-shell backpack variants, the body of the ArcEnCiel has a minimalist capsule shape that will minimize drag, whether riding at a high or low speed. The practical intelligence displayed by the bag’s design is only matched by its superior build. The rucksack has been crafted from 1000D nylon, which is abrasion-resistant as well as tear resistant. We found this motorcycle backpack to be a highly versatile rucksack, in addition to being a stylish accessory. The compact shape holds not one, not two, but three zipper compartments – all of which can be used for various purposes. The biggest compartment can store a laptop plus other large items such as notebooks. The second, medium compartment can easily hold your tablet and other stationery. The third, small compartment is ideal for your phone and wallet. You would think that three compartments should suffice for a compact backpack, but there’s more. Smartly hidden at the bottom of the backpack is another mini pouch, for easy accessibility. Why easy accessibility? Suppose you are on your bike and need to grab your phone, wallet, etc. The mini pouch allows for easy extraction with one hand, without distracting you from the road. The ArcEnCiel is certainly not short on surprises for a bag that is small and compact. If you wish to listen to music as you cruise around, a headphone jack at the top of the bag allows you plug into your music device – which can then be safely stored in the backpack itself. Then there is the subtle MOLLE system on either side of the body, enabling you to hook items onto it. One of the reasons why the rucksack made it on our list of the best motorcycle backpacks is because of its comfortable ergonomics which allow you to carry heavy weights, with little effort. There is enough padding for the bag to rest on your back, without putting any strain on your neck or spine. In fact, the shape will probably even correct your posture, keeping your spine in a healthy position instead of drooping. The shoulder straps are another part of the backpack that helps in the intelligent distribution of the weight. The straps can be easily adjusted to suit your wearing style. The ArcEnCiel is certainly a versatile, multipurpose rucksack that is available at an easy-to-grab price point. The ergonomics of the bag certainly makes it an even more appealing accessory. Last but not the least, the AXO motorcycle backpack. Throughout the list, we have talked about bags that display a level of design sophistication and are packed with features to make the product one step above its competition. The AXO does things a bit different: something that is a soft spot for us. The rucksack has a sort of simplicity that makes it even more endearing. There is no overt tactile styling or stealth design, just a highly durable fabric that skips the plain, dark color motifs that are so common to some of the other motorcycle backpacks. What you get instead, is an eye-pleasing two-tone color combination with smart graphics that should appeal to the biker in you. The AXO may possess a simple design aesthetic, but it packs enough features to make it an accessory worth carrying around. There is a large compartment that can easily fit a full-face helmet inside. Then there is the medium-sized front pocket which can hold all your essentials such as your wallet, keys, phone, etc. You will also find a mesh pocket on the side where you can store your water bottle. And that’s all there actually is to the AXO – simple yet functional. Put the motorcycle backpack to work, however, and you will find the rucksack to be a smart, compact accessory that will surprise you with its performance and endurance. The tough nylon material does also play its part in making the AXO a durable and resilient backpack. Even when you speed down the freeway, the bag allows the wind to flow past just as an aerodynamic-enhanced bike bag would. The last backpack on our list makes it here for its sheer simplicity of design and economical price point. The AXO motorcycle backpack is a great option for students and the young at heart. Putting together this list has been quite the ride. There are truly some great options when it comes to choosing a motorcycle backpack. Our endeavor has been to act as a filter, weeding out a million different choices and presenting only those which we felt could heighten your riding experience. We have also tried to factor in a diverse range of choices as we believe that different riders may have different requirements from the bags they carry. We hope you’ve found this list useful in finding the right motorcycle backpack for you. Changali's hobbies include surfing, skating, photography, and writing. He holds two Masters degrees and is also the proud author of two books: 'The Princess In Black' & 'Greater Than A Tourist – Auckland'. Motorcycles backpacks are becoming more and more common. There are several different kinds of high visibility motorcycle backpacks available. 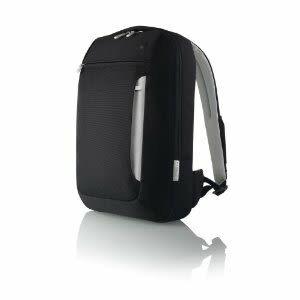 The Belkin Slim Backpack is a lightweight, versatile back pack, designed to carry your laptop and everyday essentials with ease.